News just in from Jim Eden at International Yacht Collection that his central listing, the 33.8m motor yacht Adriana III, has had a significant price cut. Adriana III was built by Horizon Yachts in 2008. MCA compliant, she is able to accommodate up to 8 guests in 4 cabins and has proved to be a popular charter superyacht in the Florida and New England areas. Adriana III provides a versatile sun deck with an outdoors barbeque, sun pads and on-deck Jacuzzi pool. 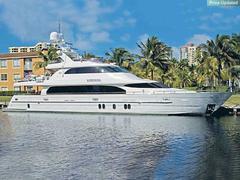 She has a cruising speed of 14 knots and is now asking $11.795 million.